You may know the catch basin by its more common name: a storm drain. It is found by the curb of your property, or somewhere in your yard. The storm drain tends to collect leaves and other garbage that flows along with runoff water. This debris collects at the bottom of the basin as the water drains away. It’s best to implement catch basin maintenance regularly to remove debris and prevent floods on your property. When your storm drain clogs, the water backs up. 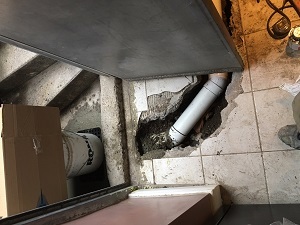 You risk your home flooding, your foundation being damaged, and sinkholes forming on your property. Any obstructions to the catch basin will prevent it from functioning correctly. When clearing leaves or lawn clippings from you yard, avoid depositing them in or over the catch basin. Don’t park your car over the storm drain. Removing build-up from dirt, sand, and other foreign matters will help maintain the health of your catch basin. It is expected that eventually your catch basin will back up, be slow to drain, or become clogged. When this happens, our trained experts can present you with a number of solutions. Support when obtaining the required permits and permission. A clean and restored property upon completion of the project. Why Dr. Pipe Drain and Plumbing Services ? Our customers love us, and our work is the best quality. Stop by our testimonials page, and then give us a call. We’ll set up your free, no-obligation inspection of your catch basin.